Hello all. I'm finally back...lol. It was a busy month last month and again I want to thank everyone who participated in our 31 Days of Halloween! I am posting today in honor of the Bombshell Hump Day Hop. Although I am not participating in the hop, I wanted to show my support for those ladies who are with my own project. The monthly challenge on Bombshell this month is to use song lyrics for your project! 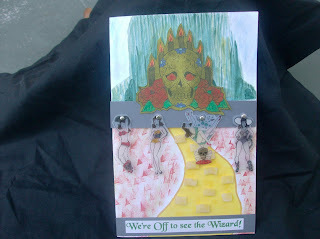 So I chose to put my own little twist on The Wizard of OZ! Go check it out! 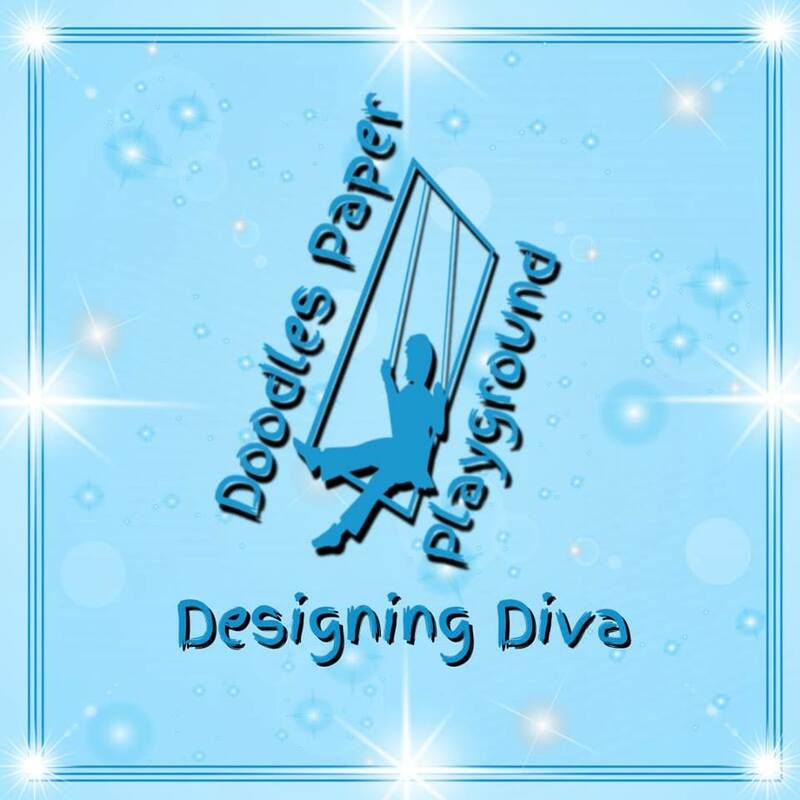 As most of you know my mind can twist anything around so that it fits into my little world! So I figured why not The Wizard of Oz. This is one of my favorite movies and one of my favorite songs from the movie is We're Off to see the Wizard. So I took that song and Bombshelled it out. 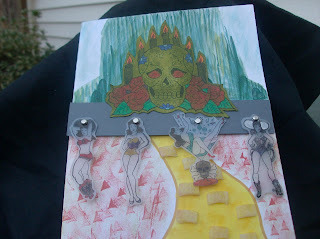 The "wizard" is an image I received in a very lovely RAK, thank you Nicole, and the "Tin man, Scarecrow,Lion, and Dorothy" are some of my Bombshell Pin-ups. I colored the "Wizard" with prismacolor pencils then covered the whole thing with a green distress ink. I stamped the pin-ups on shrink paper and then colored them with paint pens and sharpies before shrinking them. The background is all either hand painted or colored, even the yellow brick road with some of it's bricks made from clay! I am really having fun with this challenge and hope that some of you are inspired to join! Can't wait to see what you create. Wow. The Alter makes a great Wizard. The bombshells look fabulous too. Great project. Thanks for playing along with the hop! Awesome OZ card Kelli, you nailed it!!! Gosh I love shrink paper! Outstanding job GF!! !